We all love to eat delicious summer foods when the weather takes a turn for the warmer. Picnics become more frequent, drinking cold fruity drinks on a daily basis becomes normal, and we’re always looking for some new food to spice up our lives. Well folks, I think I’ve found it. Add it all together, and you’ve got mango salsa! It is very important that you use fresh ingredients in this. It makes for a much better taste. While I admit that I did use a can of pineapple tidbits, everything else was fresh and the cilantro was from my garden. 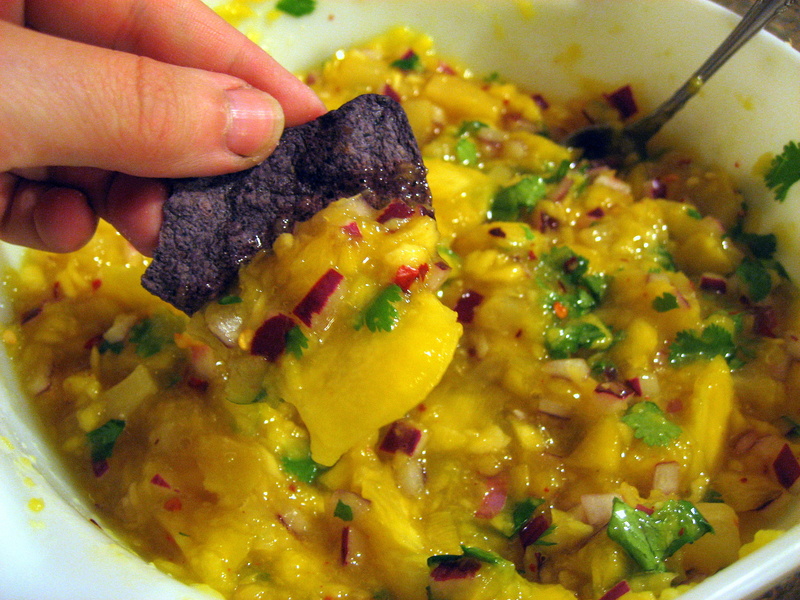 This salsa is great because it offers so many flavors…you bite into it and at first get the mango, then pineapple, then a burst of ginger, onion, and cilantro, and it leaves you with a spicy taste in your mouth. Here’s a bit of what I was just munching on. It tastes great on a blue tortilla chip! Oh, but one more thing…if you think you need to double the recipe to get enough to last you, you don’t! That’s what I did and now I have enough to feed a small army. Who wants some? ?